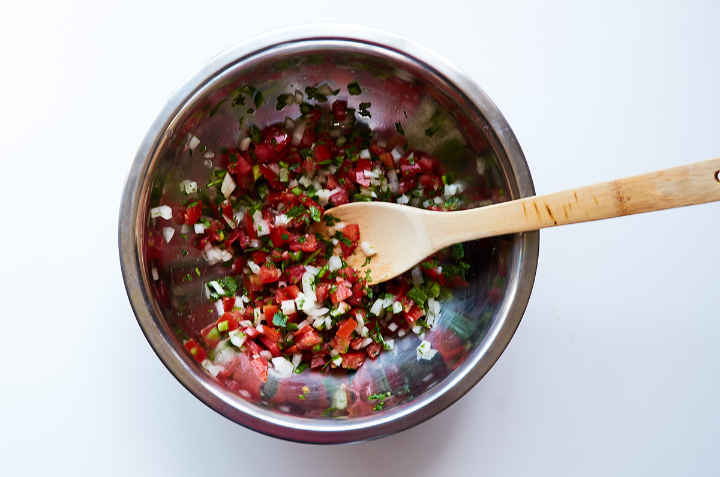 Serve this authentic pico de gallo recipe with carne asada, chicken, fish tacos, beef tacos, molletes, and of course chips. You get bonus points if you make your own tortilla chips. Use it as a topping for just about anything. Don’t limit yourself to using it for Mexican food. You want to choose really ripe red plum tomatoes. The riper the better. The flavor is built around the tomatoes and enhanced by the other ingredients. 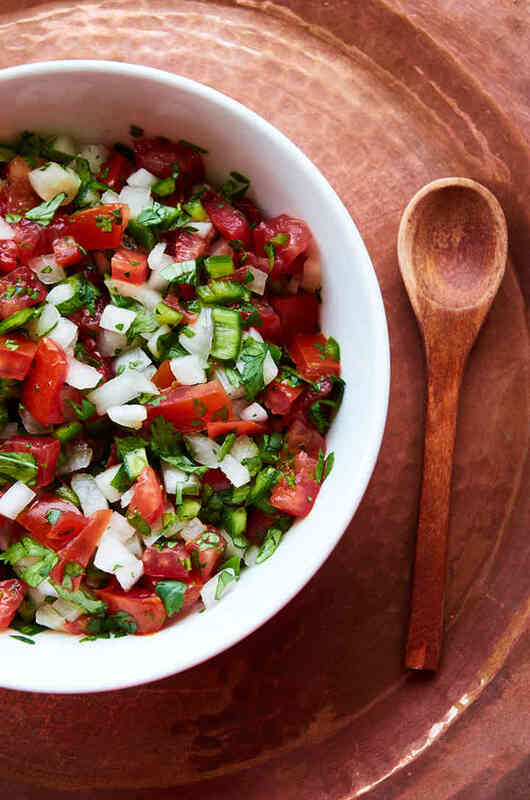 Unripe tomatoes will make your pico taste like cardboard. 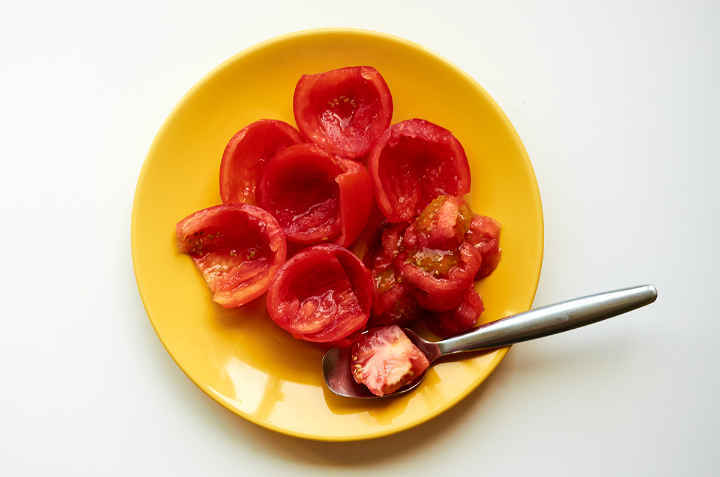 Only use slicing tomatoes, like beefsteak tomatoes, if plum tomatoes are not available. Cut the tops off the tomatoes then slice in half lengthwise. Use a teaspoon to scoop out the seeds and pulp and discard. 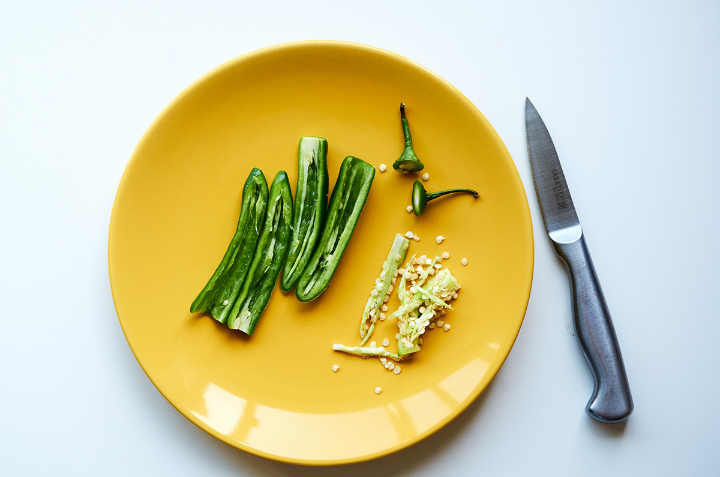 With a paring knife, remove the tops of the chiles and then slice in half lengthwise. Use the tip of the paring knife to cut out the seeds and veins. 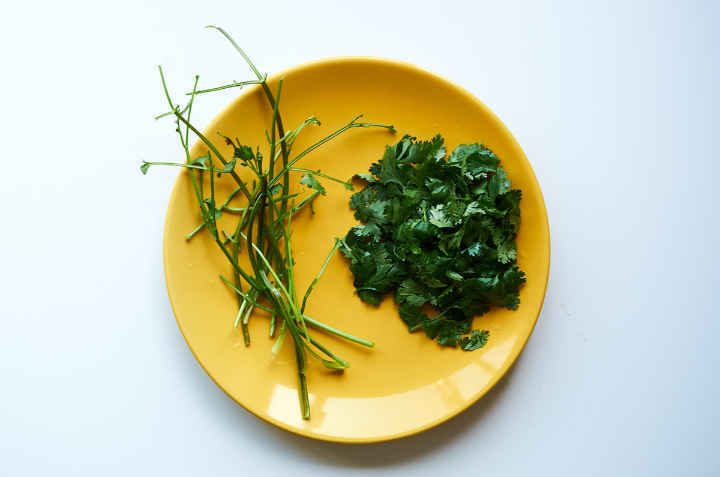 Remove the cilantro leaves from the stems and discard the stems. Chop the tomato into 1/4″ inch pieces. Finely chop the onion, cilantro, and serrano chile. Put the chopped ingredients into a mixing bowl. Add the salt and lime juice. Stir until ingredients are mixed evenly. Great for parties – It is one of the best party dishes, quick to prepare, tasty and loved by everyone. You can make it year-round but it is especially delicious during summer when tomatoes are at their peak. Mexican food has the reputation for being heavy and greasy, unjustly deserved in my opinion. This dish is the complete opposite. All vegetables, low calories, and no fat. Totally guilt-free. Eat with reckless abandon. It is vegetarian and vegan to boot. Kids will eat it too because it is “salsa”, not yucky vegetables and it works just as well with fussy adults who don’t like vegetables. 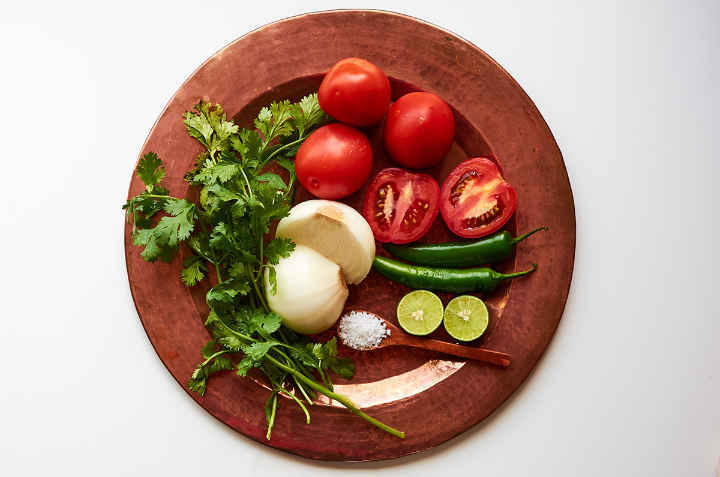 This easy to make homemade pico de gallo recipe is a delicious combination of Roma (plum) tomatoes, white onion, cilantro, serrano chile and a splash of lime juice that you will find on every Mexican table. A great vegetarian and vegan option. Chop the tomatoes into 1/4" pieces. Finey chop the onion, cilantro, and serrano chile. Add all of the ingredients in a mixing bowl. 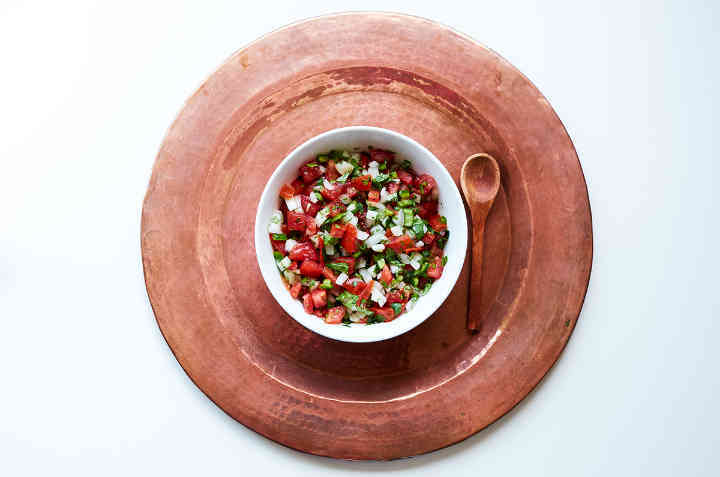 Pico de gallo is best eaten fresh but will keep for one day in the refrigerator. Presentation counts. 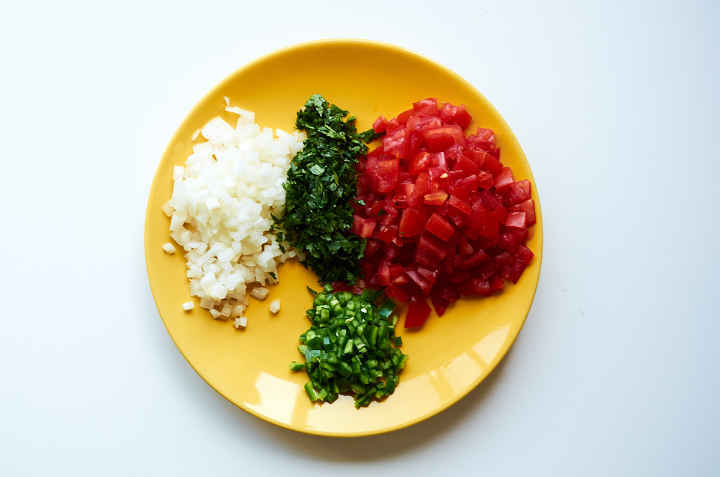 It such a simple dish, so make sure that the ingredients are chopped evenly. 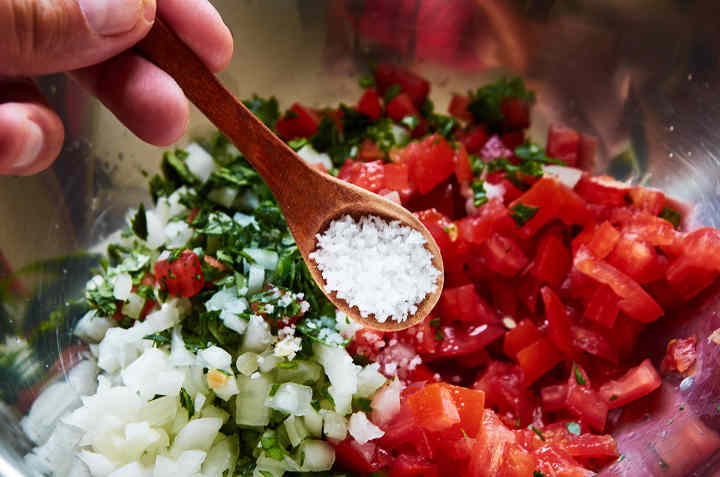 The juice of one lime brightens the flavor of the pico de gallo. If you add too much lime it overpowers the flavor of the other ingredients. You want to maintain a nice balance between the flavors of all of the ingredients. 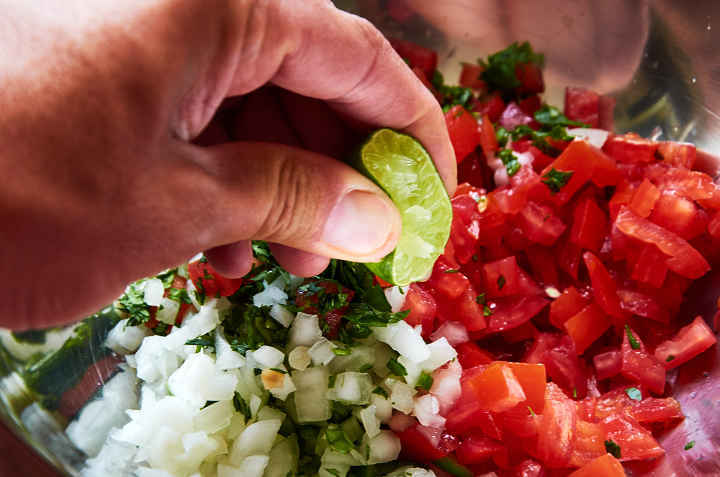 Choose the Mexican lime, also called the Key lime when making pico de gallo. It is the traditional lime for making Mexican food. Standard lime doesn't add the same bright flavor. Purdue University has some in-depth information on the Mexican Lime which is quite interesting if you want to geek out on limes. You can substitute jalapeño chiles for the serranos. The taste will be similar but the salsa won't be as hot. Many recipes call for red onion but white onion is traditional. How Odd. I lived in Phoenix AZ for a year and ate Mexican food because it was the most economical. I bought food from taberna grills to ferias to taco trucks to food sold from the tailgate of a pickup; and I never found out I was allergic to cilantro until I moved to Minnesota! Why? Because the Mexicans never used cilantro in the food they sold. I think cilantro is put into mexican foods to punish gringos that don’t know better. Your are funny – dude. I have eaten both Tex-Mex and authentic Mexican food, both in North and South America most of the dishes had cilantro in the dish. 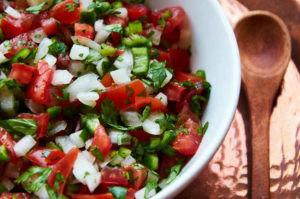 Fermented pico de gallo is “da bomb”.